It’s official: London is in vogue. Paris and New York were so last year, dahling. It’s goodbye to the iconic Eiffel tower and the metropolitan skyline of New York City, and hello to Big Ben, the Gherkin and the London Eye. You might not think there’s anything particularly glamorous about a giant Gothic clock and a skyscraper shaped like a pickled vegetable, but it seems Paperself (the false lash brand making headlines) doesn’t agree. These popular paper lashes with their sweet and intricate designs have never been shy of the spotlight. Last year they appeared in the UK X-Factor and this year they made their Hollywood debut in the Hunger Games. 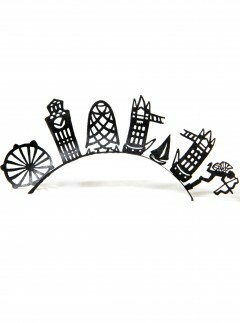 This month, Paperself is celebrating all things British by launching a new London-themed lash (pictured) in time for the much-anticipated Diamond Jubilee and 2012 Olympics. Has Britain, with our drizzly afternoons, relentless love of tea and endearingly terrible rail service finally gained credence as an icon of glamour? If you want a classy way of expressing your love for our country this summer (and you don’t want to plaster yourself in Union Jacks), head over to Paperself and purchase yourself a pair of these sweet and quirky London-themed falsies.